From left, Dept. of Indiana State Commander Jerry Blake, Emerson Bostic and Dept. of Indiana District 6 Commander Roy Barrett. 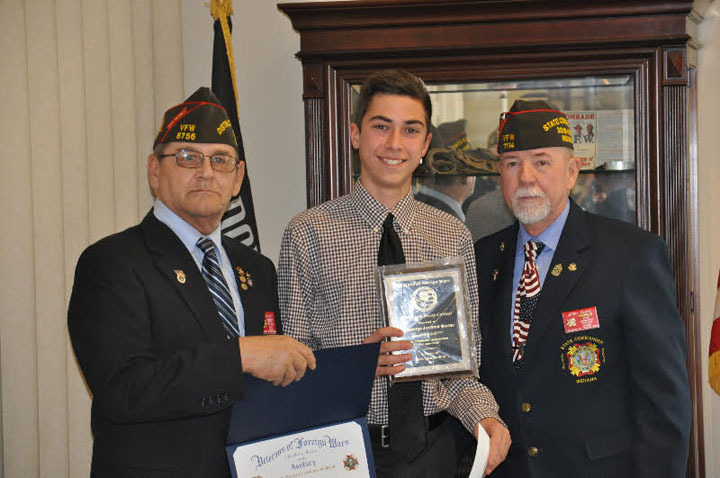 An essay originally crafted to win a trip to Washington, D.C., with the Westfield Middle School also won Emerson Bostic recognition from the Carmel Veterans of Foreign Wars Post and an advancement to VFW District 6, where he placed second. Bostic’s essay was written on, “The America I Believe In.” He said he was inspired by his family, grandparents and great-grandparents to write it. 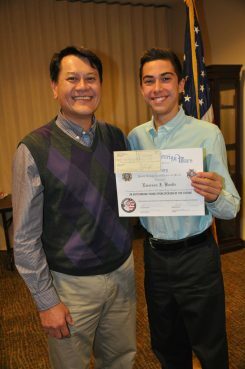 Bostic’s essay, a submission into the Patriot’s Pen contest sponsored by VFW, won him the trip to D.C. It also won first place for the county, and Bostic was presented with a cash award and a certificate. His essay was then forwarded to the district competition, where he placed second. His placing earned him a plaque and another cash award and certificate. Much of Bostic’s passion for history and desire to visit Washington, D.C., was instilled by Mark Capin, an eighth-grade social studies teacher at WMS. Bostic invited Capin to his awards ceremony. The VFW Patriot’s Pen essay contest is targeted toward sixth through eighth graders and also features a Voice of Democracy contest for ninth through 12th graders.